It has been 11 years since YouTube. It is the second largest search engine. It is the most visited social network site on the planet. 6 out of 10 people today choose Online Video over Live TV. 46% of people today consume online video on mobile. And yet more often than not Internet marketers use YouTube as “one more social network” rather than a powerful way of connecting and reaching their target audience. While some selective major brands have been killing it on YouTube, most others have been limited to launching their TV Ads, their product demo, an office party or an off site event. Long term commitment to strategy and brand storytelling is often missing. Here is a guide to help brands and small business to get started with YouTube the right way. Channel trailer is the first video which auto-plays when a person lands on your YouTube Channel Page. Channel trailer should match and reflect what the video quality, type and story telling style of your content. Communicate WHY strongly in your channel trailer. What sets you apart, should be the why people follow you. End it with a strong call to action to subscribe. Most users convert into subscribers after landing on your channel page. In order to leverage this use a channel banner which captures the interest of the user. You can even share your brand’s other social channels like FaceBook, Twitter, Linkedin and Snapchat. This helps people other options to stay in touch with your brand. A good banner typically reflects the style and personality of the brand. Posting a schedule and sticking to it will help. Keep it non promotional. Channel banners are not Advertising banners. It should give people a hint on why he or she must stick around. Titles and thumbnails attract attention from a heap of other videos on YouTube. Titles and Thumbnails is not a set it and forget it element. It needs to be A/B tested and tweaked for best results. Use thumbnails which has colors and styles which are complementary/contrasting to your competitor’s video thumbnails. This will help you grab attention and clicks. The first 15 seconds of the video is what hooks people up. You can show a teaser of the climax in the first 15 seconds or even show something totally off topic yet totally unexpected. Casey Neistat does this best. Stories are what people are, what people to connect to most. Not just ideas and facts. As a brand your job is to tell a story which will engage your audience. For instance, if you are an adventure travel company your story could be around how people have changed their perspectives after a skydive or a hike through the Andes. According to Dan and Chip Health to make an idea stick it has to have these 6 ingredients. Simple – It is easy to grasp. If the audience has to pause or replay your video to understand your message you need to simplify. Unexpected – As humans we are hard wired for finding weird coincidences. The person who didn’t follow the conventional path get talked about. Countries which succeed despite global recession become heroes. The unexpected stuff gets talked about. It is also what hooks people stay till the end of the video. Credible – Transparency is key. Don’t shy away from streaming a footage from your workplace. Closer you as brand are to the face of the viewer deeper the connection. Concrete – Concreteness builds trust. Abstraction builds confusion. Concrete and practical ideas are easier to digest. People find them useful and are more likely to subscribe to your channel. Emotional – Human beings are irrational when it comes to emotions. Emotions are dear and deeply ingrained in human sub conscious. We think based on logic but the tribes we follow and decisions we make are based on emotions. Make sure your video/story has a strong emotional pull. Positive emotions like hope, happiness, inspiration will get it more shares than the one’s with negative emotions. It is NOT about you. It is NOT about your product. It is about creating content which will entertain and inform your audience and keep them hooked for life. As per YouTube’s official playbook for brands brands should focus on creating Hero, Hub and Hygiene type content to make their content marketing holistic on YouTube. Hero – Hero content is the stand out content which is targeted on increasing reach of your brand among your target audience. This is typically the mashup or lists kind of posts which have higher potential of getting picked up by large media houses like Buzzfeed and Upworthy. Hub – Hub content is the meat of your channel. This is why your channel exists and focuses on the core message you want to deliver to your audience. If you are a brand which sells razors the hib content could be around men grooming and being a confident man. Hygiene – Hygiene content focuses on the basic content addresses issues which your target audience face. For a brand which sells shoes a hygiene content piece could be around “How to Tie your lace right” or “You have been tying your lace wrong all your life”. YouTube SEO, like the general SEO process starts with finding the right keywords that people are searching for.You need to find what your audience is looking for on YouTube in your country. Keywordtool.io is a great tool for this purpose. 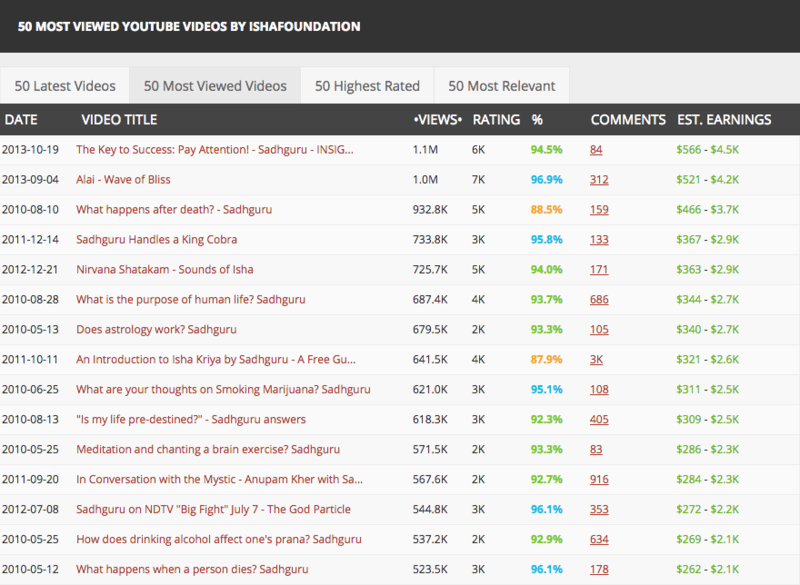 Using this tool you can find out what people are looking for on YouTube, its search volume and the search trend. Title – The title should be click worthy and keyword rich. The title is what incites people to click from the search results page. Having keyword in the title is critical SEO on page factor. Description – The description should define what the video is about. It is place to give context and summary of the video for the users to understand. 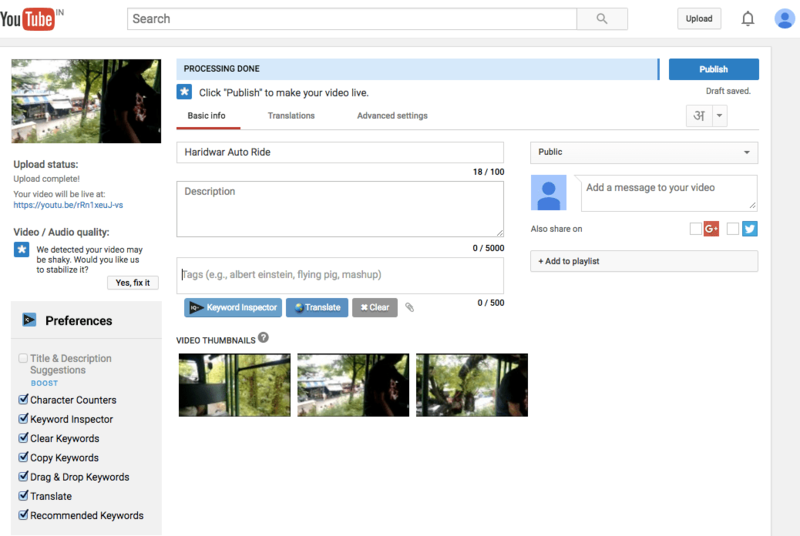 Tags – Tags are clues for YouTube Search engine to understand what the video is about once it gets uploaded. Using tags helps YouTUbe quickly understand what the video is about and its chances of showing up in search results goes up immaterial of the recency of the video. In youtube card link to playlist – This will help people get a complete series of videos which will increases their time spent on YouTube further. Leverage End Cards – Give your audience something to watch at the end of the video. You can point the user to a relevant video or a teaser of your upcoming episode. Translations – Use translations in your video description and captions to help users of different country and language find your content and engage. Captions – Using captions in your video helps people grasp your content better. THis increases the probability of they sticking with you. This increases retention % and watch time, a key metric for YouTube SEO. YouTube is becoming an increasingly effective option for advertisement and with the ease of advertising on YouTube through Google Adwords, it is accessible to even the smallest of advertisers. If you are planning for YouTube video ads, a good idea would be to start with finding where your competitor’s are running their ads. This can be found out using SEMrush Video Advertising Tool. This data can be used in two different ways. Once you know which videos your competitors are running their ads on, you can either directly target them but that would also mean a bidding war with your competitors. Now a different way of doing it is to look at the videos that your competitors are targeting and trying to understand their audience profile. Once you get a better feel of what are the preferences for those target audience groups, you might be able to target other videos that can appeal to the same group. Below is the list of all YouTube Channels where Amazon Ads have been played along with useful information like times the Ad was played, # of Ads played, Number of times the Ad was viewed to the total views of the video. Social Blade YouTube analytics tool gives stats on the performance of a YouTube Channel. Enter the channel you want to analyze and you can see its historic growth, estimated Adsense earnings and top 50 popular videos. The tool is free to use. Every brand wants to position and promote a message among its audience. Knowing this message and style of delivery will help you what possible perceptions your target audience might be having about your brand. Understanding Ad messaging will help you understand what type of products or which kind of events is your competitor trying to get attention for. Once you know this you can either come up with a messaging which positions you against your competitor or target an audience which your competitor missed talking through in its Ads. 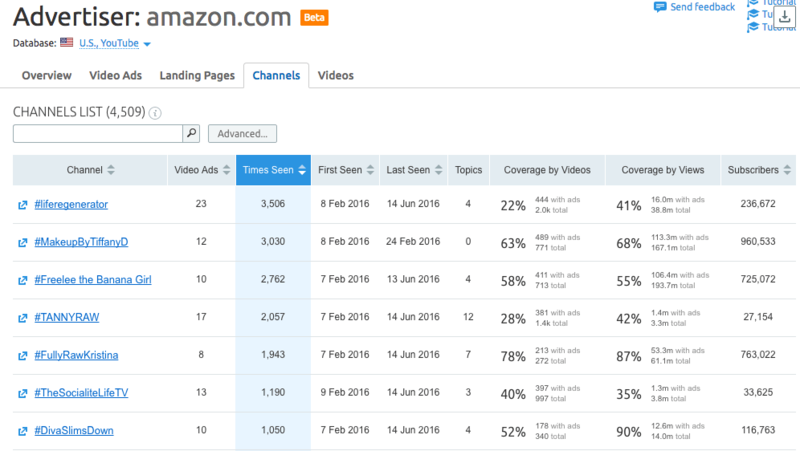 SEMRush Video Advertising tool gives a list of all Ads your competitor is using to reach his target audience on YouTube. You can do this by signing up for a free 30 day trial with SEMRush. 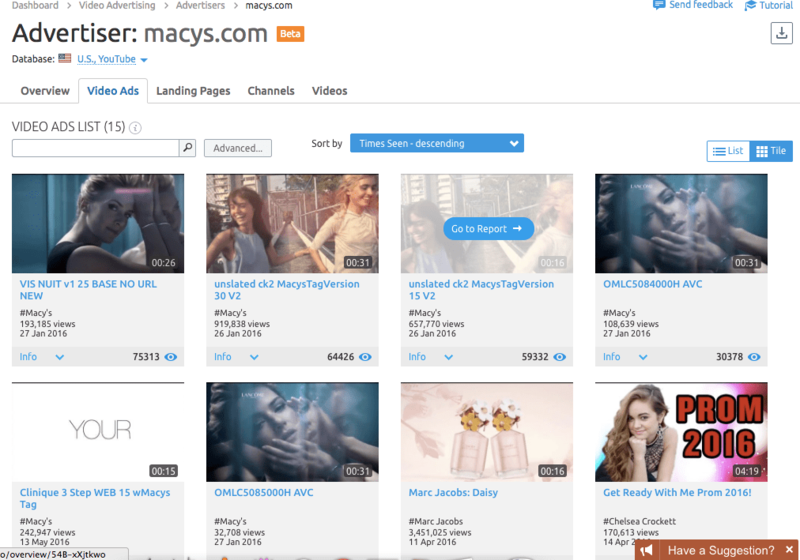 Following are the list of Video Ads used by Macys.com to promote its products and brand on YouTube. All work on YouTube is to build a community of loyal listeners. Listen. Act. Repeat. Increase subscribers – Subscribers get intimated every time you post a video. Subscribers tend to watch your upcoming video with more zeal and more likely to share it among your friends. Higher the number of subscribers lesser the need to depend on other channels of promotion. Engage – Listening to feedback via comments is great but having a meaningful conversation is what gives your audience the feeling that they are being heard. The more you reply the better the chances of the user returning to your channel/video. Partner – Affiliations are one good way to promote your channel in a vertical which is parallel to your own. If you sell hiking equipment a good channel to partner with would be a company which arranges corporate outings for weekends. Take Polls – Use the end cards and CTA buttons to collect poll from users. You can take feedback on improving the channel with your current audience and work on improving your channel.